An electric toothbrush can be a great replacement for a manual toothbrush. To get the most out of an electric toothbrush, however, it’s important to understand how to use one properly. In this blog post, we’ll go over the steps to brushing with an electric toothbrush, and we’ll also answer some of your other questions about this type of brush. How long should I brush with an electric toothbrush? Some people think that just because they have an electric toothbrush, they can brush for just one minute or less. The truth is that you need to brush for at least two minutes – and that’s whether you’re using an electric brush or not. In fact, you might need to brush for even longer if you’re using an electric toothbrush than if you were using a manual toothbrush. Sounds counter-intuitive but it’s true! What’s also true is that if you brush for less than two minutes then it means you’re not cleaning your teeth effectively. So make sure to brush your teeth for at least two minutes – and even longer if your teeth need it. Fortunately, most electric toothbrushes nowadays come with a timer that lets you know how long you’ve been brushing for. This is one reason why dentists often recommend electric toothbrushes over their manual counterparts because with a timer, you can be certain that you’ve brushed to exactly two minutes. How do I brush with an electric toothbrush? First, place the bristles of the toothbrush against your teeth and then turn on the toothbrush. Make small, slow circles against the external surface of the tooth. Try to get under the gums and between your teeth, as these areas are often where plaque and bacteria build up. After a couple of seconds, move on to the next tooth, and then the next, until you’ve cleaned the external surface of all your teeth. At this point, you should still have a minute left to clean the inside surfaces of your teeth. The method here is the same as before – simply place the bristles of the brush against your teeth and make small, circular movements. You should clean each tooth for around two seconds before moving on to the next one. Should I brush my tongue with an electric toothbrush? The answer is yes, you should. This is because your tongue is an area where bacteria can accumulate. To clean your tongue with an electric toothbrush, simply place the toothbrush head against your tongue, turn the toothbrush on and then gently scrub your tongue clean. It’s best to change your toothbrush head every three months or so. Also, you should change the head even sooner if you see that the bristles are becoming worn and splayed. By making sure that the toothbrush head you use is in good condition, it will make brushing your teeth more effectively. If you’d like to speak to one of our dentists about electric toothbrushes or any other dental topic, simply make an appointment with by our friendly reception staff! Turning 40 is a milestone that many people consider to be the start of middle-age. As well as being a time for transition and reflection, it’s also time to think about your dental health. That’s because if you’d like to reach old age with all your teeth still intact, then it pays dividends to start thinking about your teeth now. So, in this post, we’ll get you off to a good start by going over the main oral health problems suffered by people over the age of 40. Gum disease, also known as periodontal disease, can occur at any age, but it’s more likely to occur as you get older. In fact, after you turn 35, you’re more likely to lose a tooth to gum disease than to tooth decay. The good news is that gum disease is preventable. The main thing you can do to prevent it is to brush your teeth and gums for two minutes, twice a day. Make sure to pay special attention to your gums, brushing them thoroughly. Flossing once a day can also help prevent gum disease. Note that if have bright red gums or if your gums bleed regularly, then you may already have gum disease. Make sure to see a dental if this is the case. Oral cancer, which includes cancers of the mouth, tongue and throat, is more frequent in people over the age of 40. Oral cancer is usually first spotted by a dentist at a routine dental check-up, so make sure you keep going to the dentist regularly. Also, do watch your alcohol and tobacco use, as they both increase your risk of getting oral cancer. Did you know that fillings don’t last forever? It’s true: over time, they break down and no longer work as well as they should. In fact, fillings are only expected to last around 10 years, although some can last longer. Your dentist will look up for worn out filings during your regular check-ups. Changes in female hormone levels during menopause can lead to several unwanted oral symptoms, including gum inflammation, mouth pain, dry mouth and increased susceptibility to plaque. That’s why brushing and flossing are more important than ever during menopause to prevent tooth decay and fight gum disease. As we get older, our mouths produce less saliva. This is bad for our teeth because it increases our risk of dental decay. If you suffer from dry mouth, then one solution is to keep your mouth moist by drinking plenty of water throughout the day. Seeing a doctor can also help to rule out underlying causes. Aging means that our tooth enamel gradually wears away. One sign that your enamel is wearing away is tooth sensitivity. Your teeth might feel more painful when you brush them for example, or when you eat hot and cold foods. Sensitive teeth aren’t only a sign of aging, however. It can happen for several reasons, such as tooth decay, worn out fillings, and gum disease. Tell your dentist if you’re suffering from sensitive teeth because you will want to rule out the possible causes. 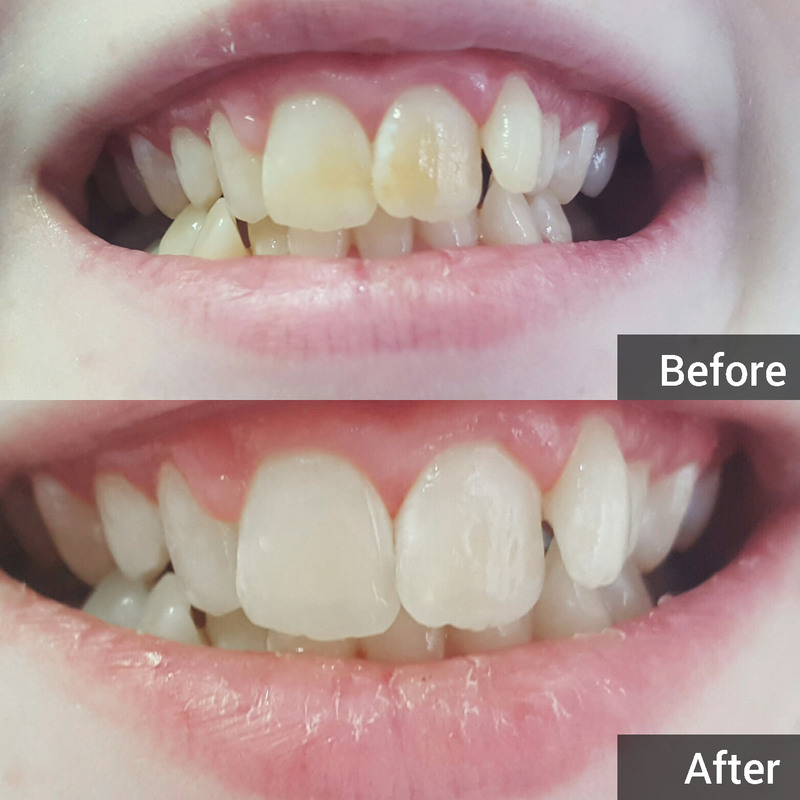 This young patient came to us because she was becoming very conscious of staining on her front teeth. She had been told previously she would have to wait until age 18 to have them whitened. 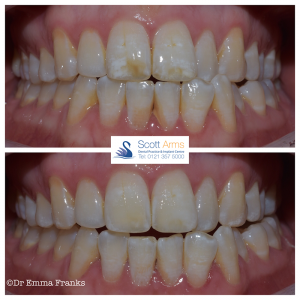 We decided to carry out a conservative treatment known as microabrasion. This involves polishing the teeth with a mild abrasive polish, to remove the staining in the enamel. 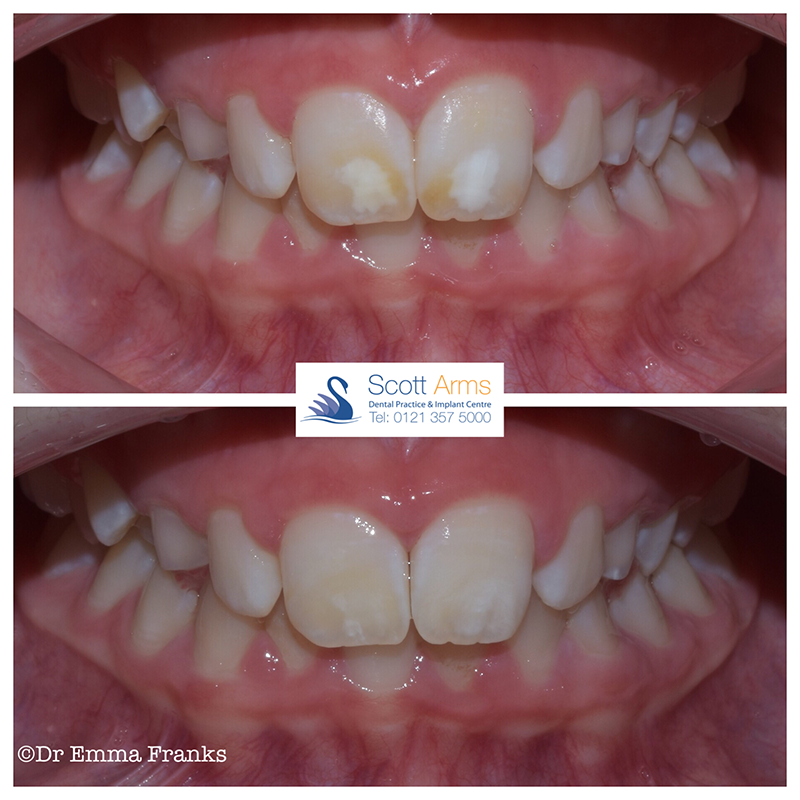 The treatment is carried out without anaesthetic, and completed in approximately 10 minutes. It is very safe and conservative. 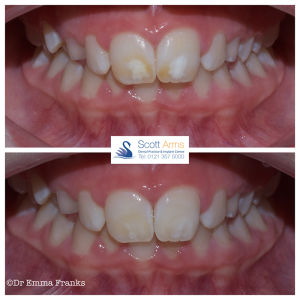 The patient was very happy with her new appearance and has gained the confidence to smile again. This treatment is suitable for various types of staining- depending on the cause and severity of the stains. It can be used in conjunction with whitening before or after the microabrasion, for more complicated aesthetic cases. If you are interested in this treatment please contact the practice. Dental check-ups are something that many people see as inconvenient and unnecessary. Why bother going to the dentist if your teeth are perfectly healthy? The truth of the matter is that we all need to see the dentist every now and then. Dentists can catch any problems in their early stages and treat them before they get worse. A check-up is also an opportunity for you to discuss your oral health and hygiene habits with your dentist. In this post, we’ll answer some of the most common questions our patients ask about dental check-ups. The typical advice is to see a dentist every six months. This allows your dentist to spot tooth decay before it becomes serious. However, six months isn’t necessarily the best option for everyone: the ideal frequency of your check-ups depends on you. Some people need to visit a dentist every three months, whereas luckier patients only need to see a dentist every couple of years. It all depends on the health of your teeth and your risk of developing problems. What’s the purpose of dental check-ups? Dental check-ups are important because they allow dentists to catch problems such as cavities or plaque. And if do you have problems then the dentist can take care of them there and then instead of letting them get worse. After all, the longer you leave a dental problem, the more difficult it becomes to treat. That’s why it’s best to catch problems early and to see a dentist frequently. 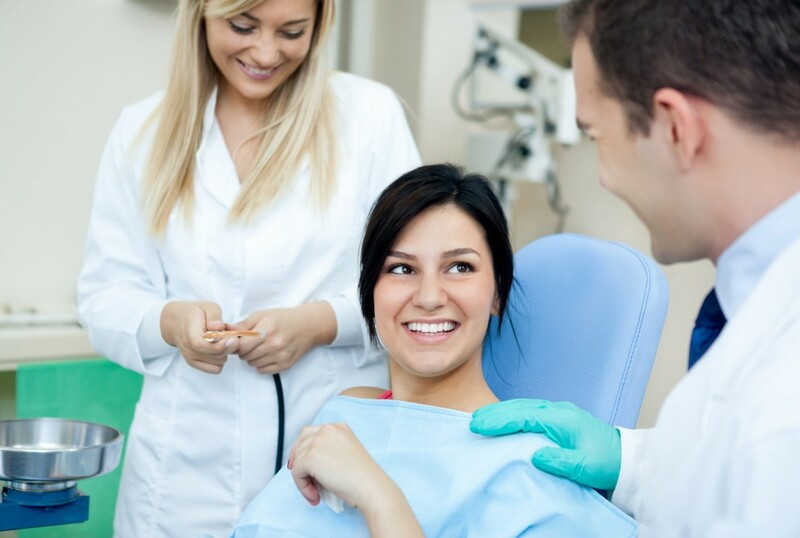 What typically happens at a dental check-up? Ask you if you’ve had any problems with your teeth since your last visit. What about appointments for other things? Along with general check-ups, you might also need to visit the dentist for other reasons. For example, if you have braces, then you’ll need to visit the dentist every few weeks to have the braces adjusted. And if you experience problems with your teeth between check-ups, then you should contact your dentist and make an appointment as soon as possible. If you wait until your check-up appointment then the problem may be worse by that point. What about dental check-ups for children? Children need regular dental check-ups too. NHS dental care for children is free, so there’s really no excuse! A child’s first appointment should be when her first milk teeth appear. After that, your dentist will advise you how often your child needs check-ups. Typically this will be around every six months. We hope that you now feel more comfortable about dental check-ups. If you have any more questions, then feel free to contact us at 0121 357 5000 or visit in person at our clinic in Great Barr. If we don’t see you, then we’ll be sure to see you at your next check-up! What’s the deal with fluoride in the water supply? 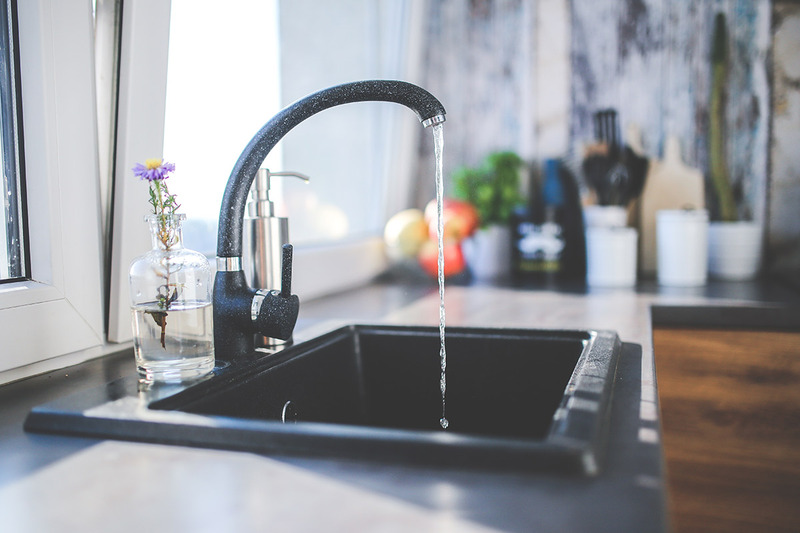 Since the 1960s, the government has added fluoride to the drinking water in some parts of the UK with the aim of preventing tooth decay. The first large scheme began in Birmingham in 1964. Today, 10% of England’s population receives fluoridated tap water, which is 5.8 million people. The places where fluoridated water is most common are Birmingham, Staffordshire and Dudley. Fluoridation is a controversial topic. On one side of the argument, people claim that water fluoridation poses health risks and is therefore too dangerous to add to tap water. Meanwhile, supporters of water fluoridation point out that that there is no evidence of side-effects at normal doses. In the early 20th century, scientists noticed that people living in areas with naturally high levels of fluoride also had low levels of tooth decay. This led to an experiment in an American city called Grand Rapids, where the city’s officials started adding fluoride to the water supply. Over the next few years, scientists found that the people in Grand Rapids enjoyed lower rates of tooth decay. In light of these findings, other towns and cities around the world quickly adopted artificial water fluoridation. In 2015, an independent organisation of researchers known as the Cochrane Collaboration analysed studies into water fluoridation. They found many flaws in these studies. For example, they found that studies from before 1975 are no longer relevant because there was a widespread adoption of fluoride-containing toothpaste after 1975. The findings of the Cochrane Collaboration shed doubt on the usefulness of mass water fluoridation. What are the benefits of fluoridated water? We know for certain that fluoride helps to prevent cavities. This is shown in cities across the UK and the world. For example The Telegraph claims that in Manchester, where there is no fluoridated tap water, the rate of tooth decay is twice that than in Birmingham, where fluoridated tap water is commonplace. What are the dangers of fluoride? One known danger of fluoride is a condition known as fluorosis. The condition is where bones and teeth lose their minerals and become porous. However, fluorosis only occurs at very high levels of fluoride. The amounts added to tap water are too small to cause fluorosis. Some preliminary research suggests that high doses of fluoride might be toxic to the brain and nerve cells. Furthermore, other studies have found that fluoride might cause learning and memory problems at high doses. However, the fluoride level used in these studies is higher than the levels found in water supplies. We know for certain that fluoride helps prevent cavities. But since we already add fluoride to toothpaste, so do we really need to add it to our drinking water as well? To answer this question, more research is needed. Governments need to know exactly how much fluoride they should be adding to the water supply. Given that too much fluoride poses health risks, we shouldn’t add use any more fluoride than necessary. Scientists also need to perform more research on the adverse health effects of fluoride on the brain. When do you need a sports mouth guard? Do you play contact sports such as football, rugby, boxing or basketball? These sports are intensely physical and unfortunately injuries are quite common, especially injuries to the teeth. Luckily, there’s something you can wear to protect your gnashers: a mouth guard. How do mouth guards protect my teeth? Mouth guards protect you from direct blows from your opponents. If you’re a boxer and your opponent punches you in the teeth, then a mouth guard will (hopefully) absorb the blow. Mouth guards prevent your upper and lower teeth from clashing together. Your teeth are the strongest part of your body, so when they collide it can be like two rocks hitting one another. You don’t want that. A mouth guard will keep your upper and lower teeth separate during the game. Mouth guards prevent you from biting your tongue during a game. A bitten tongue doesn’t sound too serious, but people sometimes need stitches after biting their tongue too hard. Mouth guards also prevent you from accidentally biting your lip too. When should I wear a sports mouth guard? You should wear a mouth guard for any sport involving a risk of injury to the mouth. This is basically any sport that involves speed, falls, body contact or flying objects like hockey pucks and rugby balls. You’d be surprised at the number of sports that are potentially hazardous to your teeth. We’re not just talking about football, rugby and boxing, but also sports like skateboarding, mountain biking, and gymnastics. If there’s a risk of injury to your mouth, then you should be wearing a mouth guard. By the way, you’ll typically only need a mouth guard for your upper teeth. However, some dentists recommend mouth guards for lower teeth if you have braces or bridges. Off-the-shelf mouth guards. These are the cheapest type of mouth guard. No moulding is required, which means they are ready to wear straight out of the packet. Although these mouth guards are cheap and convenient, they are also often bulky and uncomfortable. Boil and bite mouth guards. These mouth guards become soft when you place them in boiling water. You can then mould it to the shape of your teeth by biting down into it. After the mouth guard cools down, it retains its new shape. This makes the boil and bite mouth guard superior to its off-the-shelf cousin, as you can mould the mouth guard to the shape of your teeth. Dentist-made mouth guards. These mouth guards are made by dental professionals in a laboratory. The lab technicians will make the mouth guard to fit your mouth exactly. Therefore, dentist-made mouth guards offer the best fit and protection. However, they are also the most expensive option. No matter what type of mouth guard you get, make sure it fits well and feels comfortable. Also ensure it’s strong and tear-resistant – it’s going to be protecting your teeth, after all.